Kirk Jonah lost his son Jack to a heroin overdose and now works to educate parents. Kirk Jonah thought he knew his son well. He thought he knew the signs that would tell him his son was in trouble. He thought his son or his friends would come to him if he needed help. Jack Jonah, 19, was a thoughtful, caring, and successful young man studying biology and working at an animal hospital assisting veterinarians with surgical procedures. But he also had a secret. One night, he hugged his father, told him he loved him and then went up to his room. That night, he injected a dose of heroin into his veins that killed him. Now Kirk Jonah wants to do what he can to help parents learn not to make the mistakes he made and understand the signs of the sickness of addiction. He told his story as part of the grand opening of a Holyoke Mall exhibit the upon which Hampden County District Attorney’s Office, the West Springfield CARE Coalition collaborated to bring awareness to the hidden signs of a potential drug problem. 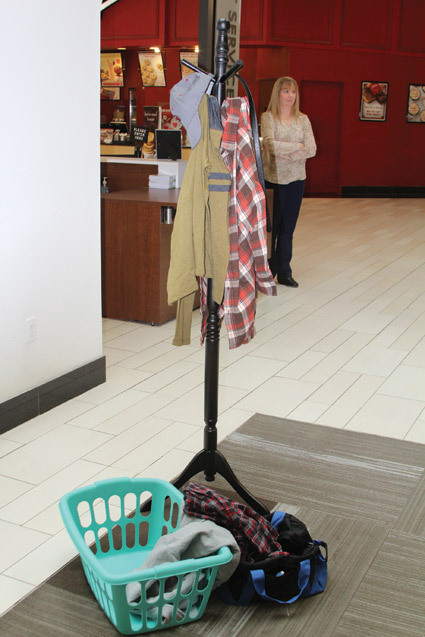 “Hidden in Plain Sight,” modeled to simulate a teenager’s bedroom, was exhibited in front of Sears at the mall throughout the month of February. 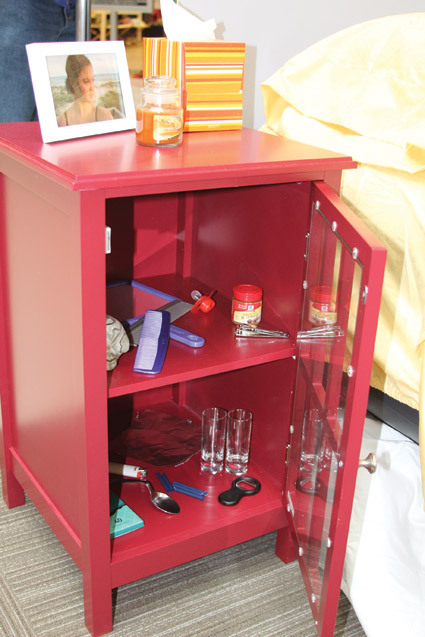 From the coat rack to the desk to the trash can, it contained a plethora of seemingly innocuous items that could in fact be red flags for parents. Paired with a guide on how these objects can be indicative of drug abuse, it gave participants a new perspective. Even those who have been educated on drug use and prevention found something they hadn’t thought of. For Kirk Jonah, it was a gym bag. 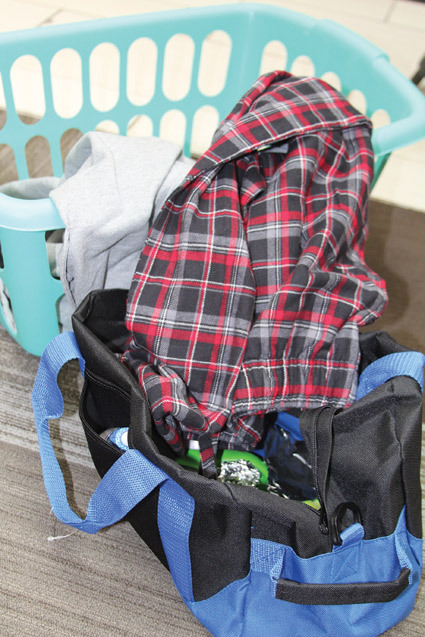 He admitted he had looked in his son’s room for signs, but never his bag and it was in his bag that the secret was kept. For more information, attend the next CARE Coalition meeting on March 2, 6 p.m., at the West Springfield Public Library Community Room, follow the CARE Coalition on Twitter (@01089Cares), visit www.facebook.com/01089cares, or email mountain@wsps.org. More information on opioid overdoses can be found at www.overdoseday.com. 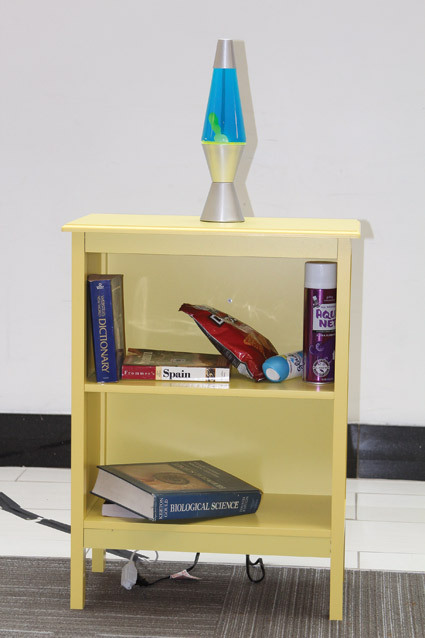 On the bookshelf: Hairspray and books can be used to conceal or store substances. Air fresheners could be used to mask drug-related odors. On the desk: A mug with hard candies can indicate drug use as sweet candies mixes with drinks can mask the taste of opioid-based pills. 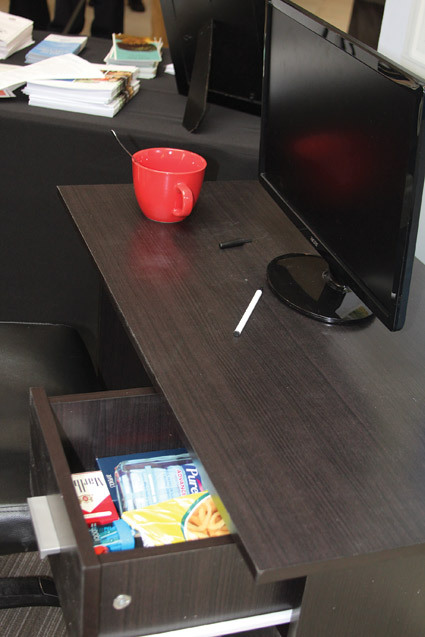 In the top drawer (pictured), hand sanitizer can be used to mask the smell of drugs on one’s person, while energy shots may be mixed with opioid pills as an “upper” and to mask the taste. Pencil sharpeners and empty cigarette packs may be used to conceal or store substances. Not pictured, but also in the desk: Broken pens, the shaft of which can be used to snort crushed pills; mouthwash, which contains alcohol and can be injested; a lighter, which can be used to “cook” heroin,” Listerine strips and Tic Tacs, which mask the odor of drug use, and Q-Tips, often used as a “filter” for heroin. On the night stand: Nutmeg can be snorted in large quantities for a high – often referred to as “poor man’s LSD;” a bottle opener can be hollowed out to store drugs; the shot glasses would indicate alcohol use; a bent spoon or tin foil and lighter can be used together took “cook” heroin; the cut straws can be used as a tool to snort heroin; a pacifier or lollipops precent teeth grinding and jaw clenching when on Ecstacy, MDMA or Molly; and a mirror is a surface upon which drugs are commonly prepared. In the gym bag: Plastic baggies and balloons are commonly used to transport heroin in powder form and the balloons can also be used as a tourniquet; dryer sheets can be used to mask the smell of drugs; a tennis ball or ping pong balls can be sliced to conceal or store substances; tin foil can be used to heat up cocaine in a solid form for consumption; and ground cinnamon has been used in the “Cinnamon Challenge,” an online video phenomenon that encourages swallowing a tablespoon of cinnamon without water and can trigger coughing and burning, which can lead to breathing and choking hazards. On the coat rack: Belts can be used to create a tourniquet, as can long shoelaces.